I spend a lot of time in the kitchen prepping, cooking, and baking. This ensures that my family is being well-fed AND that we are saving money. My reward for all this work is knowing that when we go out to eat, we can do it well. It doesn’t have to be expensive, but it does have to be fresh and real. So, on our 2 day excursion to Asheville, we took advantage of our time there. 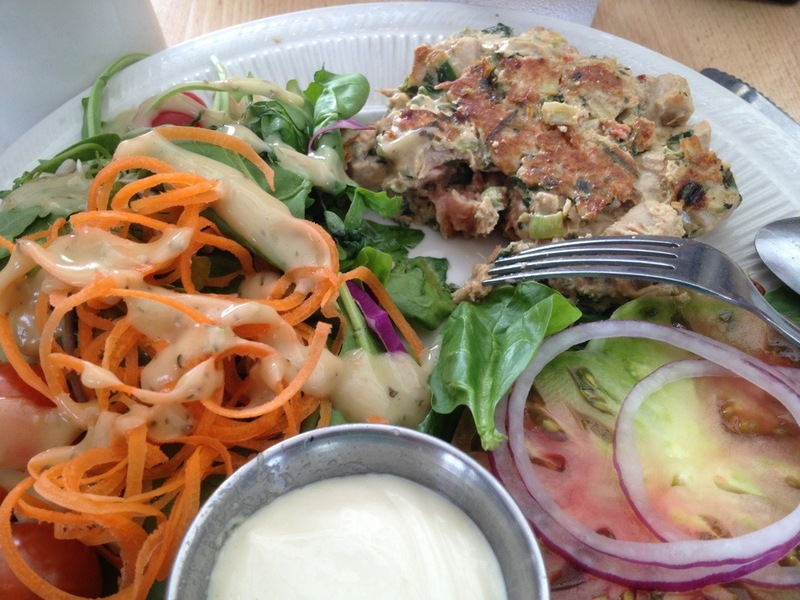 We love to eat, and the following pictures show it.Our favorite spot to visit is Sunny Point Cafe. They specialize in breakfast, but have some great main dishes too. They also grow a number of their veggies in the garden that sits alongside of the cafe (that’s where my “bee on the flower” photo was shot). Scott loves their carrot pancakes (that I did a “remake” of at home), and I love their Ahi tuna burger and their bean and veggie burger. And their local grits with local goat cheese also tops my list. 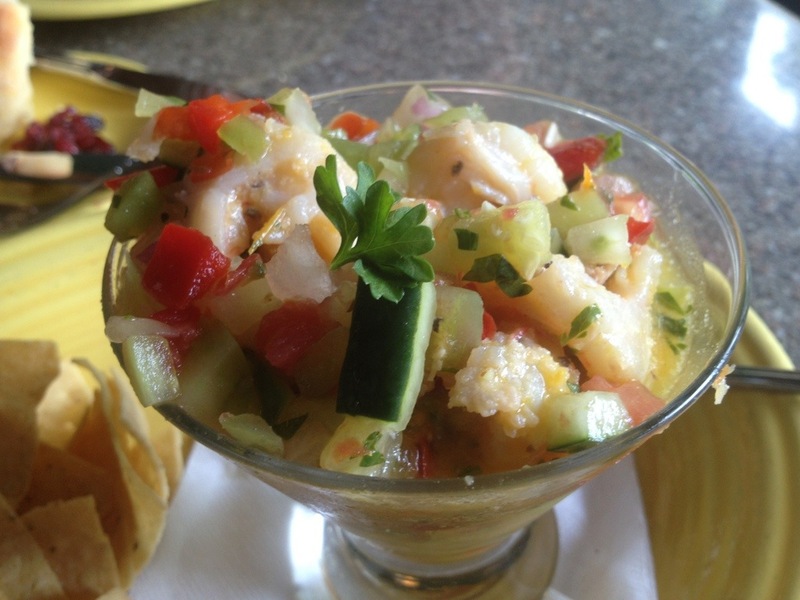 We also headed to Tupelo Honey Cafe where I ordered shrimp ceviche – excellent flavor and very filling. On our last night there, we tried a new spot for us – Carmel’s. The salad I ordered was loaded with fresh berries, almonds, and goat cheese (there are a lot of goat farms around which is fine with me!). We all know how easy it is to overcook a chicken breast, but this one was super moist. 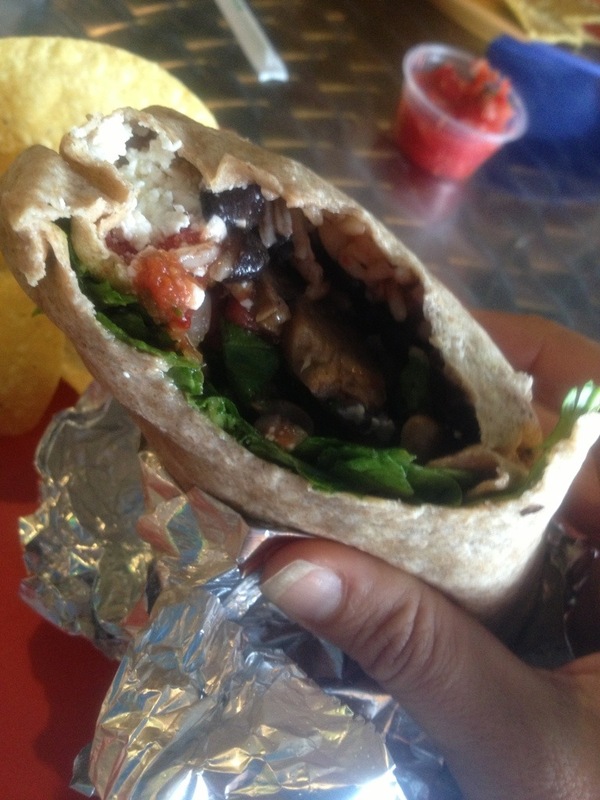 I ate every bite of the entire salad 🙂 After our 6 mile hike, we went to Neo Burrito and I ordered the Spinach Cotija Burrito – rice, black beans, mushrooms, spinach, pesto, cotija cheese, and salsa. Did I mention a salsa bar for all your salsa needs? The Berry Salad with Blackened Chicken from Carmel’s – blueberries, strawberries, and raspberries galore! Our final destination was Spartanburg for the RecSpo Conference. This event took place in the new Star Center which hosts Upwards Sports. What an awesome facility! The purpose of Upwards is to teach students the skills and sportsmanship of various sports while teaching them about the love of Jesus. And that is in part why we were there. 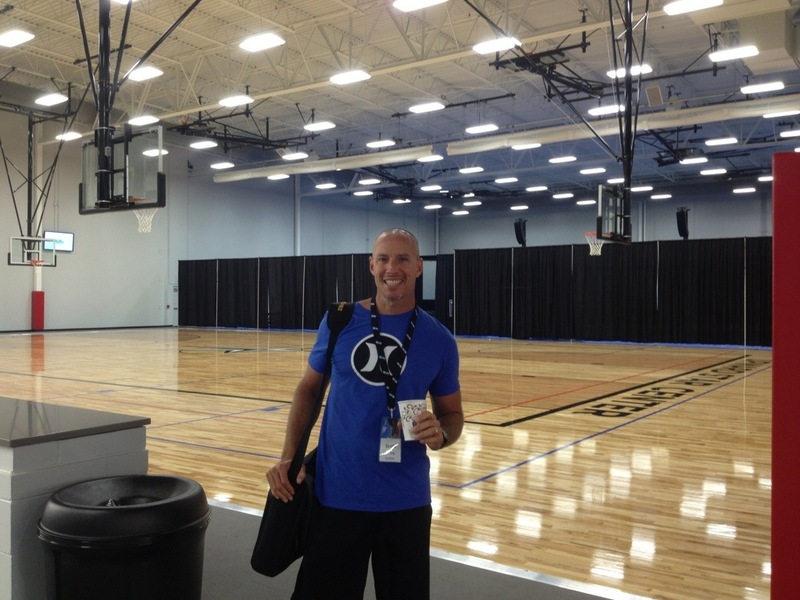 While this began as a trip to earn credit for Scott’s seminary degree, it soon became an event we looked forward to attending since fitness and sports are highly valued by us. And even more importantly, we knew we would be learning how to reach people for Jesus through sports. Our hearts were blessed, contacts made, and prayers begun as we seek to see what God is calling us to do through the recreational activities we are involved in. While I know God has something specific He is calling me to do, and I am seeking Him on this, the one thing He did reveal to me while I was there is that I must be intentional about sharing Jesus with others where He currently has me – schools, ballet, football, grocery stores, and with friends and family. Please pray for me as I head forward with this truth and with whatever it is God is directly calling me to do. I am humbled and excited to see what’s in store for me (and my family)! With the beginning of travel season just ahead, it is timely to share tips and encouragement to eat well on the road and wherever your journeys may take you! Thank you to Cole Mill for contributing to today’s post. You can check out more of his healthy living tips at his blog, Cole’s Mill. When you go on the road, there is no reason to resign yourself to an extra five or ten pounds. There are so many opportunities to have high-fat deep-fried food while you are on vacation, and if you don’t have a plan, it’s going to be very easy to simply pile your plate high and forget all about your dietary goals. Take a moment to think about how you can stay on top of your eating while you are out of town. The rules that work at home also work while you are on road. Before you head to your hotel or wherever you are staying, pick up some healthy snacks like fruit. Whether you love apples, oranges, plums or peaches, pick up a bag and leave them close to hand. Fruit is great because you can eat it out of hand, and it requires no cooking at all. The sweetness of fruit helps you avoid sugary treats like candy. Any nutritionist will tell you that you should plan your meals. If you know what kind of meals you are going to be eating, you will not have to make snap decisions that will end with you at a fast food restaurant. You can use online maps to find out what food options are available in the area or on the way. Make it a point to avoid fast-food spots if you can; instead look for places where you can sit down. Often overlooked, being in the right hotel that can accommodate to your healthy lifestyle can make all the difference in the world. Doing a little research to determine the best place to stay is very important. I have tried all sorts of methods and determined that the most effective form of research is online reviews. I was recently traveling out west and found a great site that listed the hotels in Las Vegas along with reviews regarding not only their amenities but also on restaurants nearby and things to do. This was so very helpful and was pivotal in booking the perfect hotel for my lifestyle. There are some restaurants that are going to be better for you than others. For example, avoid buffets and any sort of all-you-can eat facilities. Places like this encourage overeating, and you’ll find that it is hard to stick with your rules when you are confronted with a buffet. Instead, look for a salad bar, where you can have as many greens as you like, or for a place that specializes in baked fish or steamed fish. If you can avoid the bad foods and make the right and healthy choices than you will be in great shape! Thanks Cole! Also, check out some of my tips for eating while cruising without gaining those extra pounds, as well as staying active on and off ship! 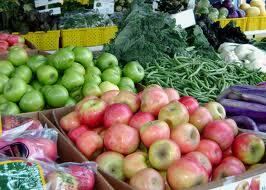 Experience the Farmer’s Market to the Fullest! Come hungry! Don’t go out to eat beforehand. Visit the market, eat the samples, and THEN go to your favorite restaurant. You’ll save money since you won’t be so hungry! Toss the gum and mints and don’t brush your teeth just before stepping out the door. It interferes with the whole tasting experience! Bring a reusable bag- you’ll fill it quickly! Bring a cooler in your car if you’ll be running around after visiting so you can place any chilled products in there to keep cool. Between my article on the front of last Sunday’s newspaper and the Christmas season, I’ve been busy making hummus, networking, bookkeeping, figuring out the wisest ways to grow my business, as well as going on a field trip and participating in the kids’ Christmas activities at school. 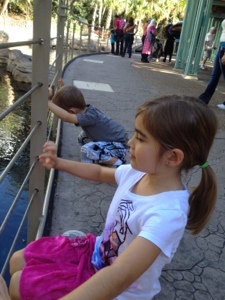 So today we are breaking away from the rush and spending some time with Pop Pop and Mimi as we enjoy the last use of our Sea World passes. Tomorrow, after church, I will be in the kitchen again as I prepare the next batch of sweet hummus for another Downtown Produce delivery. Catch me there on Friday and Saturday (11 AM – 3 PM) as I am handing out samples for those of you who are anxious to try it! 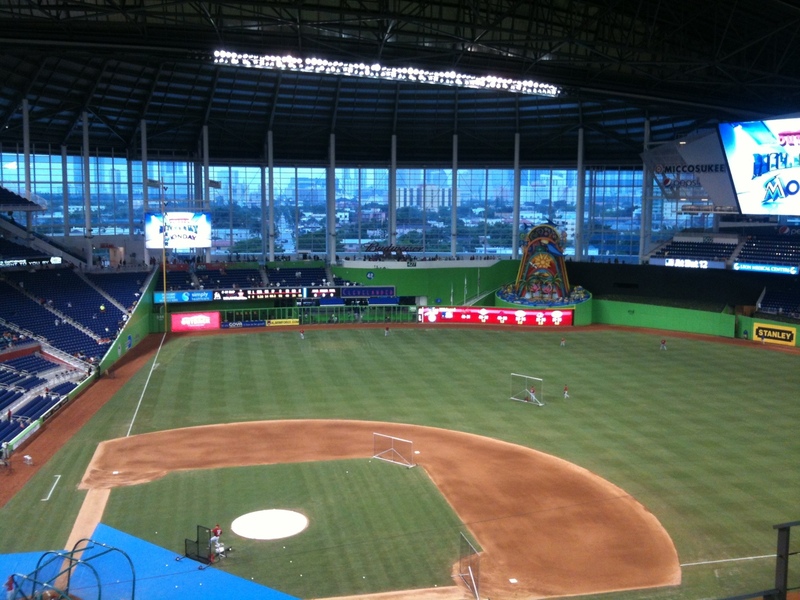 Several months ago, Scott had the opportunity to purchase two tickets to a Miami Marlins game for their inaugural season in the new stadium. He called me and asked which date I wanted to go, and I told him to choose. He picked June 25th, and we stored that date in our iPhones. And that was that for awhile. Two weeks ago, when I had my appointment with the eye specialist in Palm Beach (about an hour and a half south of us), she stated that she needed to see me back in two weeks as opposed to the monthly visits that I had been doing. She is only in the Palm Beach office twice a month, so what date did I have to come back and see her? June 26th! What does that tell me? It tells me that God had orchestrated the timing of the baseball game to coincide with that of my doctor’s appointment. So a 3 hour trip down south to a baseball game was “conveniently” tied into a necessary doctor’s appointment. Scott and I booked a hotel room and had a mini-getaway! God knew that a little fun was needed to break up the mundane, a bit of R&R was a required to shake up the necessary. 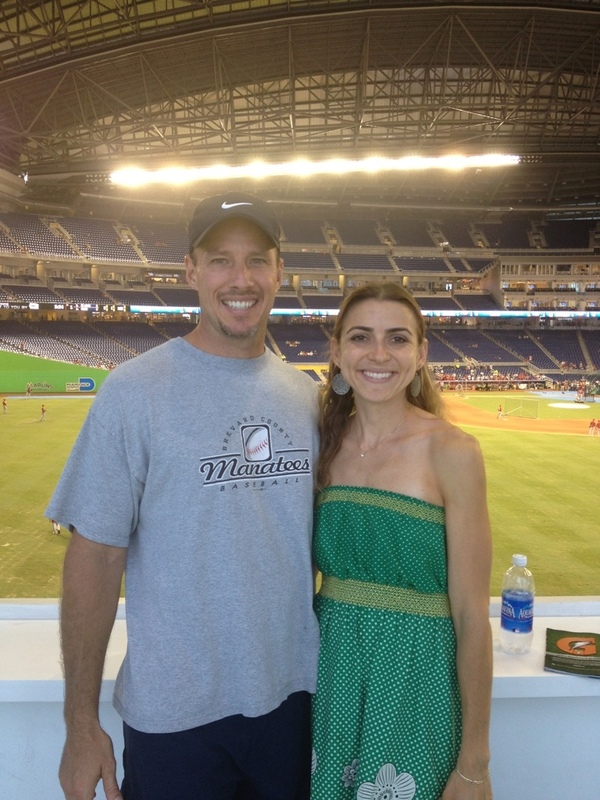 The game was relaxing and yummy (latin cuisine at the ballpark!) and, thankfully, the doctor’s appointment came with good news of the beginning stages of healing. Thank you to all of you who have lifted me up in prayer. They are coveted and appreciated! One of my favorite names for God is Jehovah-Jireh: The Lord Will Provide or The Lord Who Will See To It. He is the One who takes care of our needs, and the One who also gives us gifts. God is good all the time, and all the time God is good! 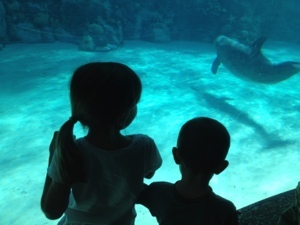 My friend Amy (a great photographer and story-teller) recently blogged about how her family comes from their home in the Orlando area to Melbourne for a mini-vacation. Quite the opposite is true for us. 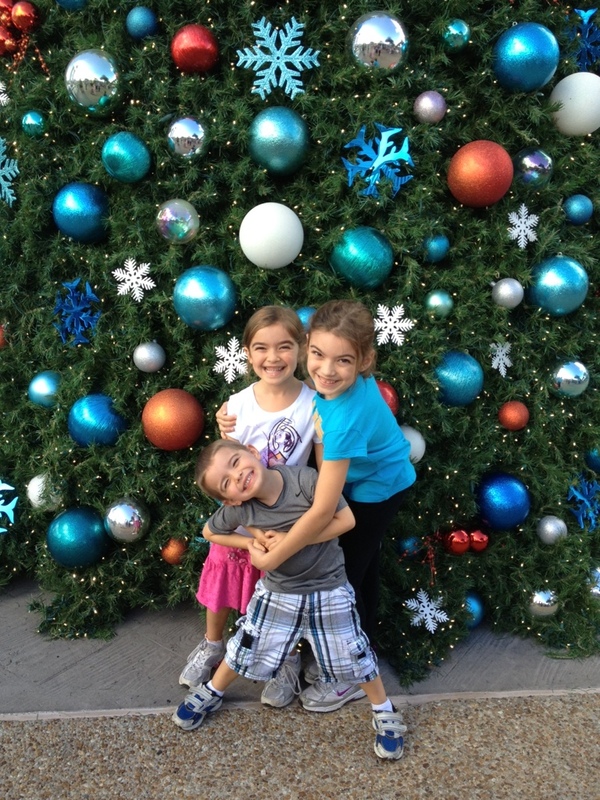 My family and I enjoy leaving our home in Melbourne and heading into Orlando for a break from the norm. We just returned Saturday from a 3-day mini vacation to O-town. It’s been a long, stressful spring and this trip was a welcomed break for us all. I am grateful for the bottom of the barrel- it was scraped and scratched until every last penny was pocketed for our adventure! 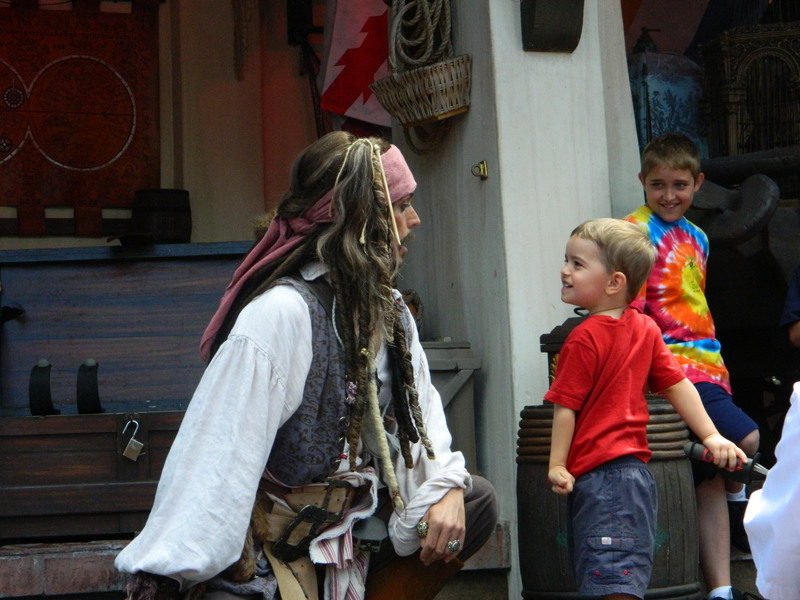 Thankfully, we had passes to Disney and Sea World so we visited the Magic Kingdom on Thursday, hung out at the hotel and swam on Friday, and went to Sea World together for the first time on Saturday. 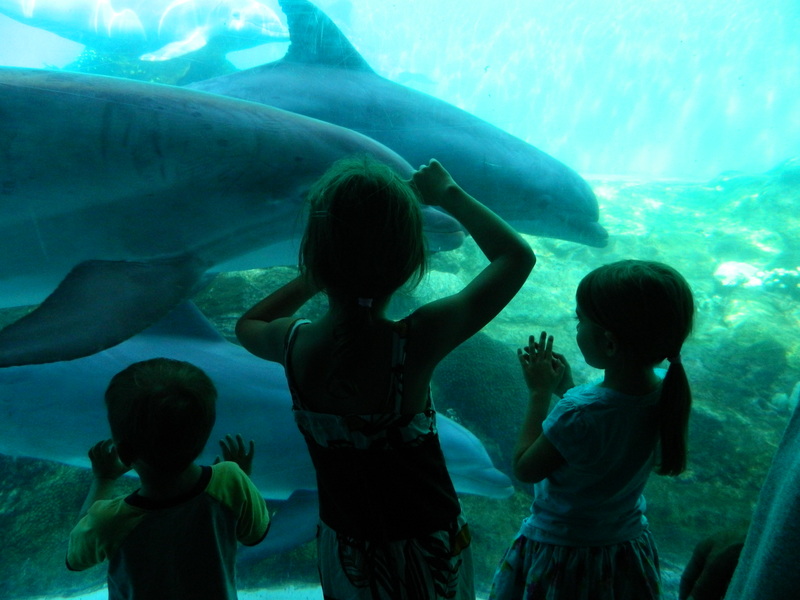 Watching the kids’ faces as they took in the sights of the Dolphin show at Sea World- they were completely mesmerized! Coming home to a clean house. My mom swept, vacuumed, and mopped my floors! She is the BEST!